DeLux office magnets in rectangular shapes. Produced of high European quality with strong holding force. DeLux office magnets tested and developed according to the highest standards and with no use of the hazardous PAH chemicals. Solid plastic shell ensures bright and clear colors and keeps the magnet safely in place. Print: Possibly at quantities over 500 pieces. These rectangular DeLux office magnets differs from the ordinary office magnets by their high magnetic strength and the guarantee of not containing any of the hazardous PAH chemicals in the plastic shell. The magnets are produced and tested according to the highest European standards. The plastic shell is developed specifically to provide the best possible color rendering. The DeLux office magnet is an excellent choice if logo/brand is to be printed on the magnet. The magnet inside the plastic shell is enclosed in a way that it does not fall out even after continuous use. 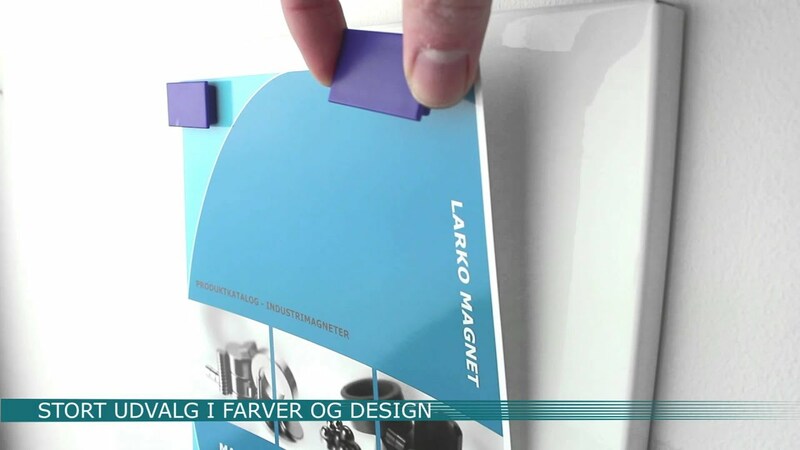 The rectangular DeLux office magnets provides a high magnetic strength to ensure documents from falling down the notice board, whiteboard or other metal surfaces. *The difference between ferrite and neodymium material is in the holding forces. The neodymium material ensures the greatest holding force and has better attachment to the metal surface as a consequence. Please see all dimensions and magnetic strengths in the “Product overview”. The DeLux office magnets comes in different dimensions. Se all dimensions and prices in the ”Product overview”. We are specialists in producing quality printing of logos and other designs. 600 dpi required as minimum - 1200 dpi is recommended. Please contact our sales department for prices. See examples of office magnets with print here. The Delux office magnet is also produced in round shapes. Please see the range of all office magnets for notice boards / white boards here. Possibly at quantities over 500 pieces.